eMO or Electronic Money Order service is different from old money order service. The old money order is sent just like a Registered Post which usually travels using Indian Railways and not by flight unless the location is not reachable by road like Laddakh etc. The new eMO is computerized version of money order. Many post offices in India have been computerized. Their processing has been centralized. For example if you do Speedpost, your Speedpost PNR number is allocated from a remote server. In case of eMO, it is even simpler. 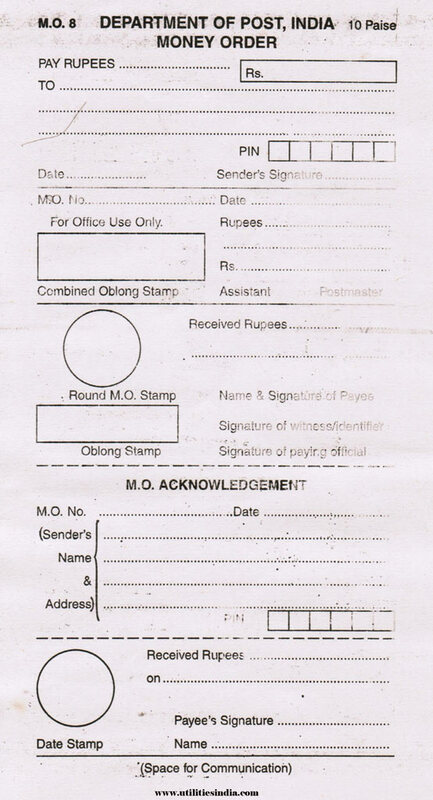 The sender & sendee details, amount of money to be sent is fed online and stored in centralized server at Mysore. It is further transmitted from Mysore to respective post offices. Please scroll to the bottom or click this eMO Form link. Is it gone? No. Those post offices which are not computerized do allow this money order service. Most of post offices in major cities have already been computerized. eMO takes around 3 days for delivery and old Money Order around 7-10 days. Secondly you can no more specify any message along with eMO since there is no place for it. Though there is place for 2 digit message code which is can be chosen by you. How much money can be sent through eMO? Buy Money Order from Utilities India! You can do money order from any post office in India, however you should prefer to go to a bigger post office as money order forms may not be available in smaller post offices. You should go between 10-12 am and between 2.45 pm - 4:45 pm. Even though the opening times of post offices are 9 am however they will open at 9.45 am usually and the staff disappears as early as 4.45pm. It costs only 25 Paisa but the post office personnel will not let you get away the form for anything less than Re 1.